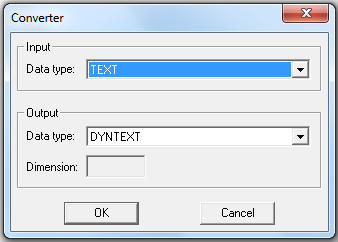 This function block converts a binary, numeric or text value into a "Dynamic Text” or vice versa. Furthermore it supports the copying of “Dynamic Texts”. For the conversion of numeric values (besides BIT) a format string can be connected with the "format" input to get a special representation (such as a hexadecimal value or limited number of fractional digits). The standard conversion is performed when no format string is linked to the function block. The conversion of single values is provided for all data types. An additional vector conversion can be performed only for the data type TEXT. The single texts of the vector are written into the allocated memory one after another and without the terminating 0 for the conversion into a “Dynamic Text”. However, the maximum length of 4095 characters cannot be exceeded. The other way round the “Dynamic Text” is divided in partial texts with a terminating 0, which are written into the vector elements. When using a target system with Unicode support, the “Dynamic Texts” are coded in the UTF8 format. Therefore standard texts can only be assigned loss-free, if they agree with the UTF8 format. Otherwise characters with a value above 127 are replaced by question marks. The reverse conversion of “Dynamic Texts” into standard texts is also limited. Question marks with a value above 127 will be written instead of Unicode characters. The format string, optionally used by converting numerical values, has to meet the target system specific conventions of the sprintf function. An overview of the most relevant features will be given here. It is possible to add any text before and/or after the format instruction. This has no influence on the conversion, but the text will be part of the output. Consider that the input "format" only allows a limited number of characters. It is recommended to use the Append function block to add more text. The type specifier is a necessary parameter and specifies the expected data type and the basic display of the input value. The flags are the first parameter(s) and are used to control the justification of the output. These parameters are not as commonly used. - Space: If no sign is going to be written, a blank space is inserted before the value. The second optional parameter defines the minimum number of characters written. If the value to be printed is shorter than this number, the result is padded with blank spaces. This parameter always starts with a dot and is a number, which is interpreted according to the specified type. - Using d, i or x: defines the minimum number of characters to be written – if the value is shorter than this number, the result is padded with leading zeros. The last optional parameter modifies the size of the data type and so the range of acceptable values. For our system there is no need for this parameter, except one. The parameter dialog can be used to select the data types of the input and the output. Furthermore the size of an output vector can be determined, when converting to TEXT. The selected data types are represented by the colors in the symbol. The parameter dialog can only be opened in edit mode.